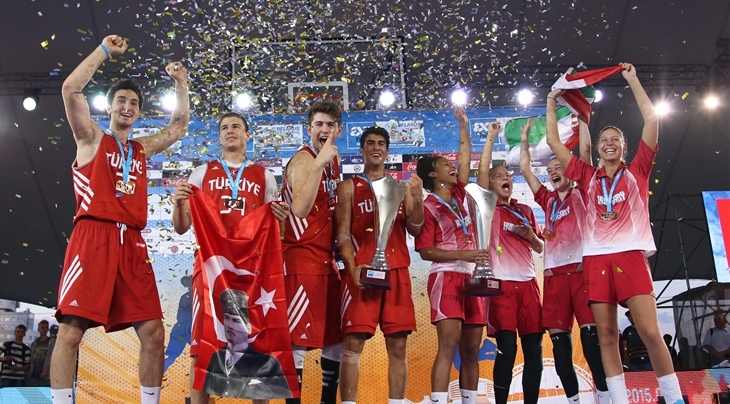 Hungary and Turkey were crowned European Champions at the 2015 FIBA 3x3 U18 European Championships Women and Men respectively after intense competition in Minsk, Belarus 21-23 August. Hungary defeated hosts Belarus 16-15 in an exciting finale that went into overtime in front of a 1,200 strong crowd at the Sports Palace in the centre of Belarus' capital city. Bronze went to Israel, who squeezed past France 16-12, having displayed fighting and team spirit throughout the entire tournament. In the Men's Competition, Turkey beat France 16-14 in an intense match-up celebrating on the centre court until the arena was already emptied long after the ceremony. Spain, thanks to a game-winning desperation two-pointer by Guillem Jou, stunned hosts Belarus 18-15 to walk away with a bronze medal around their neck. More medals were given during the Championships in three individual contests. We break down all the action of Day 3 with a total of eight games being played on the main court (full day video here).